When you are facing strong competition in todays ever changing and volatile business climate, how will you overcome the odds? When its time to initiate strategies that can help your team weather any storm, how will you motivate them to make the right decision instead of the easy one? When you seek effective managers and supervisors who can inspire and lead their teams, how will you determine who is ready to accept the challenge? Captain Larry Brudnicki led two dramatic rescue missions during the worst weather in 100 years, dubbed "The Perfect Storm." This harrowing story of real people battling for survival on a sea gone wild became a best-selling book and a top-grossing film starring George Clooney. 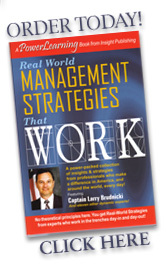 How can Captain Larry Brudnicki help your Corporation, Association or Organization? His presentation will benefit individuals, groups or organizations that make decisions, act as teams or employ the elements of risk management. He has made a career of assessing risks, making critical decisions and inspiring teamwork. You have seen Captain Brudnicki on ABC, The History Channel, National Geographic, The Learning Channel, Discovery, The Travel Channel and The Weather Channel. Now listen to his first hand account of how he made life and death decisions, and motivated his crew to perform their best in conditions that are beyond imagination. Captain Larry Brudnicki is the Perfect Speaker to motivate and inspire audiences. Creating innovative solutions to the ever-changing engineering support requirements of the White House during President Reagans inauguration. Directing all Coast Guard operations and coordinating the efforts of 80 government agencies to provide for the safety of life, property, and the environment during the 1995 Americas Cup Race. Leading the team of engineers that developed and implemented a program converting all federal buoys and lighthouses to solar power. This project drew international recognition, and praise from the Department of Energy as the ONLY successful government program of this magnitude. Establishing a proactive waterways management system in the state of Alaska, and saving the federal government from the $5 billion liability of the clean up operation after the EXXON VALDEZ disaster. Managing teams in air and at sea to prevent the import of illegal drugs into the United States, resulting in the confiscation of more than 150 tons of cocaine, including the 10 largest cocaine seizures in the US two years running. 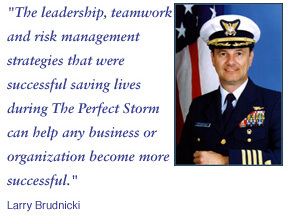 "If Captain Larry Brudnicki can guide his team through perilous life and death situations during the perfect storm, he can certainly guide you to safely and correctly analyze risk and reward." Captain Brudnicki has been featured as a commentator and guest expert on ABC; the History Channel; National Geographic; the Discovery Channel; the Weather Channel, the Learning Channel, the Travel Channel, Outdoor Life Network and a myriad of other programs. As a contributor to Real World Management Strategies That Work, he details the 7 steps to making the right decision every time. And in his upcoming book, Leadership Secrets from the Perfect Storm: Practical Solutions to Succeed Against Impossible Odds, he reveals all of his leadership secrets from the past to help you chart the best possible course toward achieving YOUR future goals. When your audience is looking for style and substance, Captain Brudnicki rolls up his sleeves and shares captivating excerpts from his Coast Guard career. With his fast-paced and quick-witted style, this highly respected leader demonstrates how to achieve high performance against all odds.